"For me 'Klödi' has been a revelation in this Tour. I hope he can maintain his current level all the way to Paris. He was clearly the better man in the Pyrenees, so I've given him 'Carte Blanche' in the Alps. I certainly won't split hairs over who works for whom." "Use 'Klödi' just as a helper when he's in the form of his life? No way! For a start, I know he is currently capable of leaving me in his wake. That's not a good thing for my morale. Secondly, I don't want to make the mistake of using him to pace me in the Alps. I need to ride at my own rhythm." "In all truth, I was quite content to plough my own furrow on the climb to Plateau de Beille. It will only make sense to enlist Klödi's help in the Alps if its to our mutual benefit. If I think he has the stronger legs, then he not only should, but must, go for it alone." 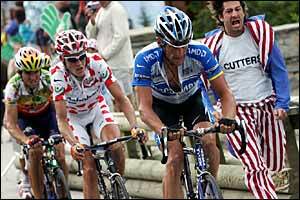 "From this point on, the Tour will be decided between Armstrong and Basso," Mancebo told L'Equipe. "There's only third place to fight for, for which I am a candidate just like Klöden, Totschnig and don't forget Totschnig and Azevedo. I tried to attack and test Armstrong's group with the hope that some riders would follow. Unfortunately, nobody wanted to, or nobody could. The key to this stage and no doubt for the Tour is the collective strength of US Postal. If Armstrong wins, it's clear he owes that to his team." "Armstrong doesn't greet me any more, but that is up to him."